Twenty-nine years old and a widowed mother of three boys. 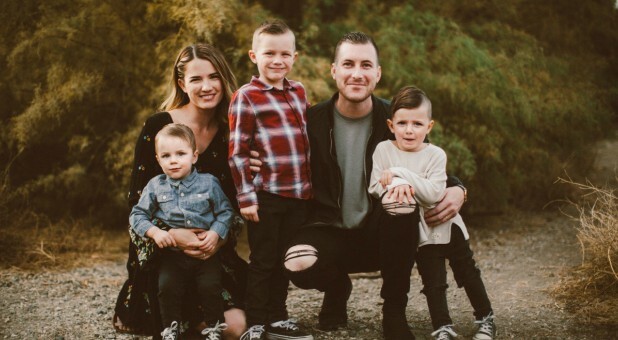 In the weeks since her husband, Inland Hills Pastor Andrew Stoecklein, committed suicide, Kayla Stoecklein has opened up about her grief on social media, sharing her heart with followers as she navigates the pain. "Telling the boys yesterday was the hardest thing I've ever had to do. It crushed me. Our oldest son, Smith, had the most difficult time processing everything. He is such a smart boy and is incredibly heartbroken," Kayla posted over the weekend. "The types of questions he asked really shocked me. 'Are you and daddy still married?' 'Did the doctors know daddy was going to die?' 'Why didn't he say goodbye?' 'What is my life going to be like without daddy?'" The megachurch pastor committed suicide in late August, reportedly taking his own life inside his church. Tomorrow I will tell the boys. The life they once knew will never be the same. The dreams they had with you are gone, just like mine. The daily routines, the daddy dates, the donut runs and the soccer games now distinctly different than before. The house will be quieter, lonelier and duller without you. You filled our house with joy. You filled our home with fun and laughter that only comes from a dad. You knew how to crack just the right joke to cheer me up when life felt overwhelming. I miss you so much, Andrew, every single part. Your story, your life and your death are opening the floor for conversations all around the world. Your story is helping people to share their hidden thoughts and secret struggles with their family and friends. Your story is paving the way for an even bigger conversation about how the church can better come alongside people with mental illness, including pastors. God is using your story and this tragedy to do miracles in the lives of other people. As much as I don't want to, I can't help but see God's hand in all of this. My mind keeps wandering back to the last message you gave titled, "Mess to Masterpiece." Just as you told the church about how God will meet them in their mess, I believe God is meeting us, right here, right now, in this mess. And my prayer today in my darkest hour is, "Heavenly Father, complete the work you've begun in me." Only God can turn the greatest tragedy in my life into triumph. In lieu of regular Sunday services over Labor Day weekend, the church hosted an open house for people to come process their grief over Andrew's death. The #CareForKayla team launched a GoFundMe, which has raised more than $256,000 of its $500,000 goal to help the young widow.